Kalorama is one of Washington, DC’s most expensive neighborhoods when it comes to real estate. And the Dresden Condominium is one of the District’s most notable buildings. This elegant Georgian Revival structure with its dramatic curved front facade was delivered in 1901 by prominent builder Harry Wardman and is widely regarded as one of his more elaborate designs. And if that’s not enough, the seven-story historical landmark is also listed in James Goode’s Best Addresses. 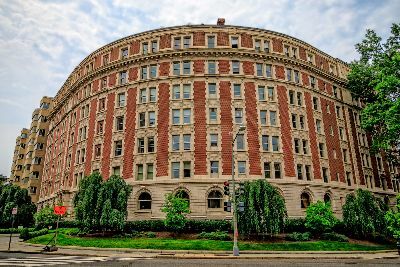 Located at 2126 Connecticut Avenue NW at the corner of Kalorama Road in the 20008 zip code, the Dresden was once home to highly coveted apartment rentals. Since then it has been converted to 62 spacious two to four-bedroom luxury condos for sale. With many of the units measuring in the 2,000 square-foot mark and the largest residence topping out at a staggering 3,175 square-feet, you might expect prices to be steep. Indeed, units here start in the mid-six figure range and climb to well over a million dollars. Other historic buildings on the same street that have been similarly restored include 2029 Connecticut and 2101 Connecticut. From the exquisite exterior relief work to the grand lobby and foyer, it is easy to see why Wardman considered the Dresden to be a stately monument to high society. The brick walls are two feet thick, and the city homes within have soaring ceilings, thick crown molding, original built-ins, and commanding views of nearby Rock Creek Park. There are also dens and eat-in kitchens, many of which have been updated with modern amenities. Of special note are the original restored parquet floors—but they are not the common parquet you might associate with drab 1960’s flooring. These floors are stunning with elaborate patterns and inlay work. Residents in this pet-friendly building also enjoy a staffed front desk and doorman, garage parking and a wonderful rooftop garden. And then there’s the neighborhood itself—Rock Creek Park and the triangular Kalorama Park are each two blocks away, and the trendy Adams Morgan community is immediately to the east. There’s coffee shops and the ever popular So’s Your Mom deli, plus an amazing number of for bars and restaurants, such as American Guest House, Mintwood Place, the Little Fountain, Jack Rose Dining Saloon and so many more. If you’re ready for true throwback style and luxury, look into the Dresden—a timeless classic.